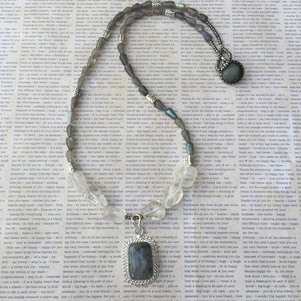 Labradorite (grey) is such a gorgeous gemstone, with an iridescent sheen. I tried to photograph at different angles to catch the effect. 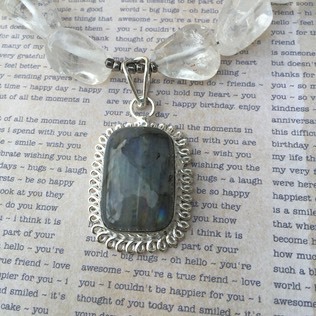 The pendant is "framed" with clear Quartz nuggets. The clasp is a button/loop closure, using a vintage button. Pendant measures 7/8" x 1-1/8". Necklace length is 21”.